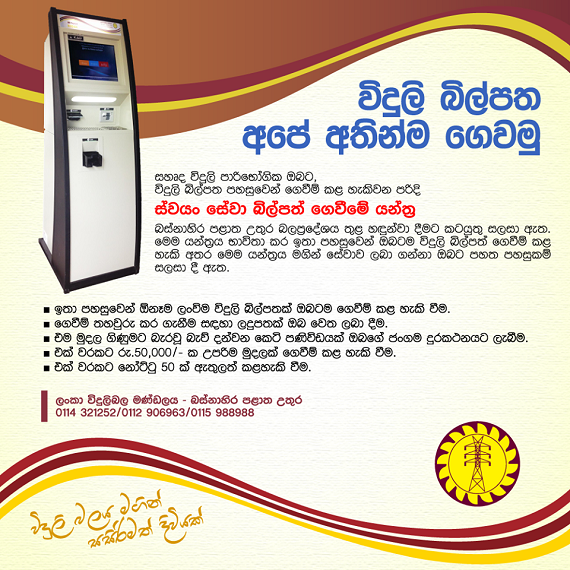 Ceylon Electricity Board introducing New Automated Bill payment Machine system for their customers which facilitate pay your electricity bill easily, at any time. New CEB Automated Bill payment Machines supports bill payment of any CEB accounts in the country. You can enter 50 notes at a time during payments. Due to security reason, maximum single payment is limited to Rs. 50,000.00. After the successful payment, machine deliver receipt and SMS notification to your mobile phone. To get more information's call 0114 321 252 CEB Customer care Hotline.